My Mom makes the best coffee cakes. The rhubarb one is probably her best. With my parents visiting – naturally we enjoyed time baking together. As soon as we baked it – I knew I wanted to share it here with all of you. It’s so easy to make that you can pull this off when surprised by unexpected guests or simply when you want to enjoy something sweet on a lazy afternoon. We are talking easy – peasy, delicious and satisfying! This recipe uses cranberries but feel free to choose any fruit you have on hand. Super easy cake with fruit! No mixer required. Juts a medium mixing bowl and a wooden spatula. Grease and flour a 9" x 13" baking pan. Add all of the ingredients ( one by one ) into the bowl and stir. The batter should be smooth and thick. Place the batter into prepared baking pan. Spread the fruit on top. In a small mixing bowl, combine all the ingredients for the streusel until it resembles crumbs. Sprinkle on top of the fruit and batter. Bake 30 - 35 minutes, until the top is golden brown and the toothpick inserted in the center of the cake comes out clean. What is your favorite fruit coffee cake? I love berries and really love this Cake!! what lovely cake! i love the tartness of cranberry in any cakes.. childhood recipes sure make us crave for them now and then..ur mom must have been a great cook! wow! BTW am first time here n fell in love with ur space.following u..
Dear, sweet Anna, just want to let you know that I am going to award you the Versatile Blogger Award today on our blog. I just love your space friend! Have a great week! I love family recipes that bring a bit of nostalgia to the table. This looks absolutely delightful…and cranberries are always a nice tart counterpart to sweet desserts. So glad you've had a wonderful time with your family visiting! This looks wonderful! Clearly your mom knows what's up 😉 I love that it's easy, too! Hi Anna, what a lovely recipe and beautiful photo!!! I wanted to let you now that I nominated you for the Versatile Blogger Award, hope you don't mind 😉 You can read more about it on my blog and I'm looking forward to your response =)) Enjoy the rest of your weekend !!! Thanks for the blog love, your site is awesome! I've bookmarked a few already that I plan to adapt GF! Thanks! I love cranberries and your coffe cake looks so…YUM ! Thank you and welcome to CCS! Mom recipes are the best, and the fact that you got to make it with your Mom is even better. I live the streusel topping. Thank you for stopping by my blog, and now you are my newest follower. Thank you so much, Becky! Glad to have you here on CCS! Totally my type of cake. So good with a cup of Chai Latte…yummy. Thanks for sharing, I will definitely try your version. My son loves coffee cake in his lunchbox. Have an excellent week-end. That sounds wonderful, Stephanie! Please, let me know if he liked it. Welcome to CCS! oh yum…I love to make apple coffee cake the best! I am your newest follower…pls follow back if you can. I mean really, what else needs to be said? This looks wonderful! I love coffee cakes especially the ones with fruits! Thanks for sharing your mom's lovely recipe! Have a nice day! Your cake looks perfect–love all the pretty cranberries in your cake! I have two favorite fruit coffee cakes–blueberry buckle and my grandma's rhubarb cake. Thank you, Jill! Blueberry buckle sounds great, but I bet your grandma's rhubarb cake is delicious! This looks very yummy! Just wanted to let you know, too, that I just sent some award love your way! This cake is so pretty studded with those berries!! There is nothing like cooking with mom! It must be coffee cake time for sure around bloggerland! Yours looks and sounds great with the cranberries! Love it and will bookmark. Same with rhubarb. Lucky you, Anna, to be cooking with your mom! Enjoy !!!!! This looks delicious! I never think about using frozen cranberries, but what a great idea! I can imagine a piece of this with my morning coffee. 🙂 Thank you so much for visiting my blog, and saying “hi”!! I'll be back soon! Hi Leslie! Thank you so much for visiting and leaving a comment. Welcome to CCS! Looks delish and so… easy! I love that you don't have to dirty a mixer! Have fun with your mom! Yum, looks like a great start to any morning! Looks yum…and such an easy recipe…a no stir cake is a treat! Hi CCS, sorry for my ignorence, why this coffee cake didn't have coffee powder in it?I mean, when I studied the recipe, I didn't see coffee was used as one of the ingredients. I read once, then twice, then 3 times. I may want to try this recipe in the future, that's why I studied it very carefully! Hi Jessie! Thank you for the question. The coffee cake does not contain the actual coffee. It's just a simple cake you can enjoy with your coffee. Hope that helps! I'd like a piece of the coffee cake with a cup of coffee… so good. I love baking with my mom when she comes to visit! Enjoy your time together 🙂 PS: This coffee cake sounds delicious! Aww, grazie mille! Spero che vi piacerà tanto quanto abbiamo fatto! Abbracci! That's gorgeous looking coffee cake! I love my coffee cake loaded with seasonal fruits too. haha aw I love the name of this coffee cake, adorable! Sounds like a fun a visit! And I don't think I have a favorite fruit coffee cake? haha i think i'd pretty much take any kind! I've never had cranberry coffee cake so maybe this could be it 🙂 I've got a bag of frozen cranberries in my freezer (they've been sitting there since the holidays.. oops) and need to use them up! Gorgeous recipe Anna! Thank you so much, sweet Kristina! I love cranberries so I always stock up during holidays. They really should be an all year round fruit, don't you think? My grandmother always used to make the best rhubarb coffee cake! I've been searching for a recipe that reminds me of it for years but no luck. Now it's been so long I'm not sure I'd even remember if it was the same! Oh, I hope you will give this one a try! Thank you so much, Jen! You had me at that first photo of the cake! Don't we all just love our own mom's cooking, or baking? Yay! I am so glad you like it, Soni! Thank you! There is nothing better than mom's coffee cake! I think it's so cool of you to share that recipe with us. Many thanks! Aww, thank you for reading and the comment! I love a coffee cake with fruit;-) Mom's have really good recipes, don't they! They sure do 🙂 Thank you, Patty! Sounds yummy and very easy to make. 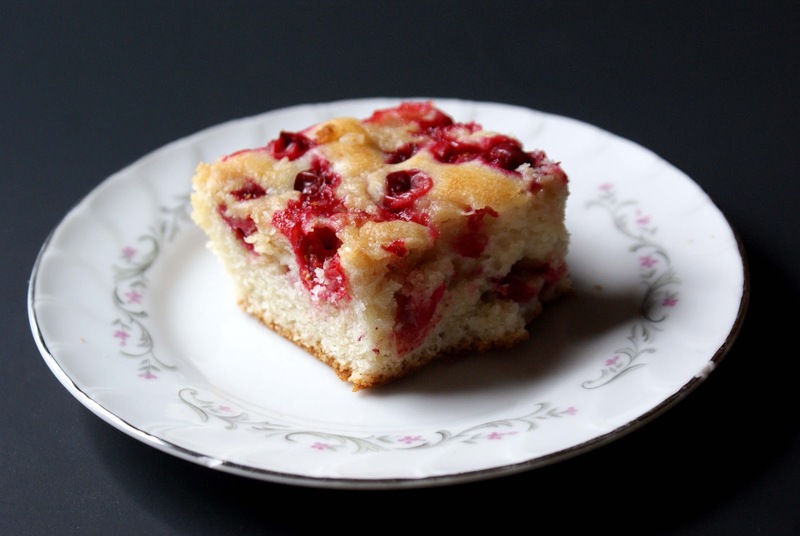 Love that you used cranberries – extra yum! This looks wonderful and easy. I love little berry cakes and Mr. Hungry Couple loves this kind of topping. Saving this recipe! Thanks. That's great! I hope you guys like it! Always nice to inherit great knowledge and recipes from mothers and grandmothers. Well said, Zoe! Thank you, my friend! This coffee cake is so beautiful! I LOVE coffee cake! This looks so delicious. I want to reach in and grab it! Thanks for sharing your moms recipe. Got to love our mommies for passing on such beautiful recipes like this one. Love this! Thank you so much, Tiffany! Hugs! I've never thought to add berries to a coffee cake- this is brilliant!! It looks delicious! How pretty and delicious looking! I have a blog friend in Iowa with lots of rhubarb that I will share your link with. When it comes to fruit in cakes, I much prefer the little berries! They have a way of distributing themselves throughout the batter more so than chopped fruit. 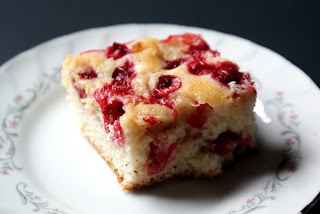 Also, the tartness of cranberries combined with that fluffy cake does make for one tasty bite. Well done! I totally agree. I have a raspberry version on the list 🙂 Thank you, Tina! what a beautiful coffee cake! i love the addition of berries in it! How pretty with the berries in it. I have always loved coffee cake (something my grandmother and I used to love to share together) especially with pecans and a glaze on top. Mmmm, pecans version sounds yummy! Thank you, Rachel!